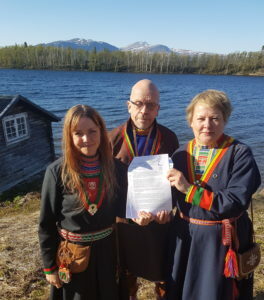 Marie Persson Njajta, Stefan Mikaelsson och Mona Persson, members of the Sami Parliament with the proposal to support the Declaration of the Rights of Mother Earth. 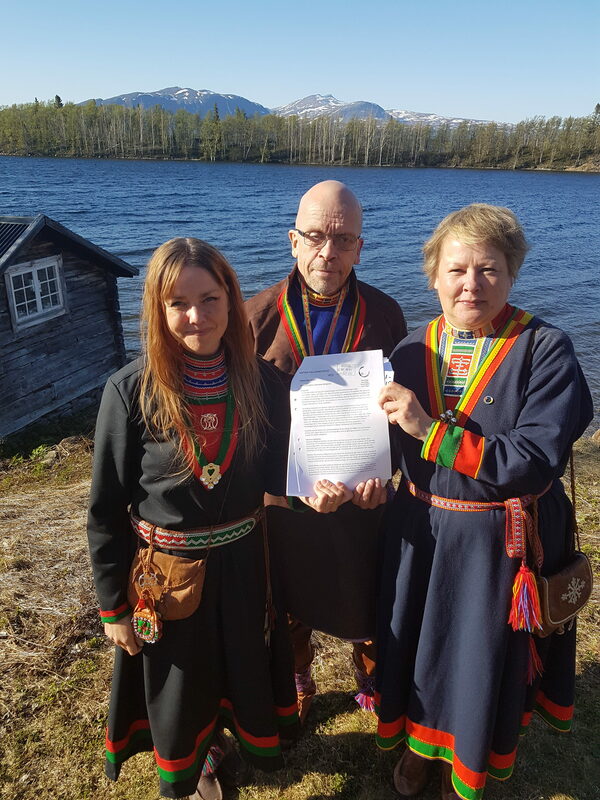 During the Assembly meeting ​​May 25th, the Sami Parliament decided to support the Universal Declaration of the Rights of Mother Earth. The Declaration includes the right of Mother Earth and her beings to life and existence, respect, to regenerate its biocapacity and to continue its vital cycles and processes free from human disruptions. The Sami, like many other indigenous peoples, have everyday experiences of how climate change hits directly for example reindeer husbandry. Their traditional ways of life is hard-pressed between climate change and exploitative mining projects and forestry. 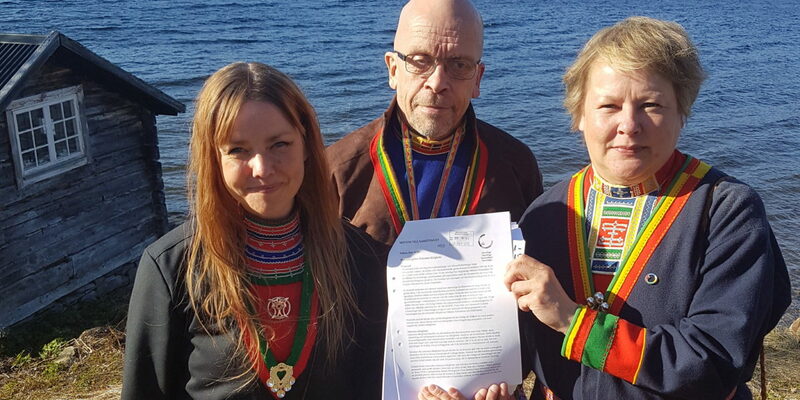 The parliamentary motion was written by Marie Persson Njajta together with Mona Persson, members of the Sami Parliament. It was signed by several other members. Marie Persson Njajta hopes that the decision gives power to the discussion on how Rights of Nature can be implemented on local, national and global level. – This is a very important decision, says Marie Persson Njajta. We wrote it for our children and the possibilities for coming generations to live a good life. We believe a paradigm shift is needed towards a view where humans understand ourselves as part of nature, which is the way indigenous people relate to nature. We, the Sami people, believe that we belong to the land, not the other way around. Today we see how a colonial perspective, exploitation, and climate change threaten our culture. And it is not just us; it is a global issue. Governments and corporations don´t take these problems seriously, but disregard indigenous rights. The decision to support the Universal Declaration for the Rights of Mother Earth is a statement against the shortsightedness of governmental policy and the failing view that corporations have rights while nature does not. – The decision of the Sami Parliament is a vital step in strengthening the Rights of Nature framework, says Pella Larsdotter Thiel, from the Rights of Nature network in Sweden. Sweden has a high profile internationally in sustainability issues, but like other countries, we systematically deplete and impoverish our ecosystems. It is very encouraging that the Sami people in Sweden, like indigenous peoples in other parts of the world, take the lead in this necessary shift in how we view nature; from a resource for humans to a living whole we participate in. The Declaration was first presented at the World People’s Conference on Climate Change and the Rights of Mother Earth in Bolivia, which in 2010 gathered more than 35,000 people from over 100 countries. It has since been presented to the UN General Assembly, and over 800,000 people have signed for the UN to adopt the declaration. Cormac Cullinan, lawyer and spokesperson for Global Alliance for the Rights of Nature who led the drafting of the Declaration, welcomes the historic decision of the Sami Parliament. – By endorsing the Universal Declaration of the Rights of Mother Earth, the Parliament and the Sami people have joined forces with the many indigenous peoples, local communities, organizations and people throughout the world who are working together to reawaken consumerist societies to the reality that our first duty as human beings is to recognize and respect the rights of every member of the Earth community to play their unique role in that community. The Sami have never forgotten to be grateful and respectful to Nature for giving us life – by supporting the Declaration they are signaling their commitment to reminding all who have forgotten that our future depends on giving effective legal protection to the whole Earth community. This year sees the 10th anniversary of the first major decision on Nature’s Rights, Ecuador included Rights of Nature in its constitution in 2008. The framework is now spreading rapidly with decisions about rivers, forests and mountains as legal subjects in, among others, the New Zealand Parliament, the Supreme Court of Colombia and the Supreme Court of the Indian State of Uttarpradesh. Sign to support the Universal Declaration of the Rights of Mother Earth!